Written by a former news reporter and editor, News Talk gives us an insider’s view of the media, showing how journalists select and construct their news stories. 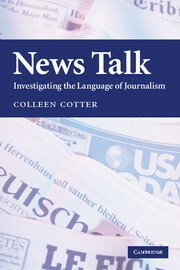 Colleen Cotter goes behind the scenes, revealing how language is chosen and configured by news staff into the stories we read and hear. Tracing news stories from start to finish, she shows how the practice traditions of journalists and editors – and the constraints of news writing protocols – shape (and may distort) stories prepared with the most determined effort to be fair and accurate. Using insights from linguistics and journalism on both sides of the Atlantic, News Talk is a remarkable picture of a hidden world and its working practices. It will interest those involved in linguistics, journalism, language study, media and communication studies, and anyone who wants to understand how news media shape our language and our view of the world. Colleen Cotter is a senior lecturer at Queen Mary University of London in the School of Languages, Linguistics and Film. She is a former daily news reporter and editor in the USA. Her previous publications include USA Phrasebook: Understanding Americans and Their Culture, 2nd edition (2001), as well as numerous articles on language and the media. For my family. . .